The March Challenge (Number 12) for the Chocolate Baroque Zentangle Group is based upon a floral theme. Chocolate Baroque recently released a sheet of rubber stamps, Tangled Garden, containing images for both tanglers & non-tanglers alike. 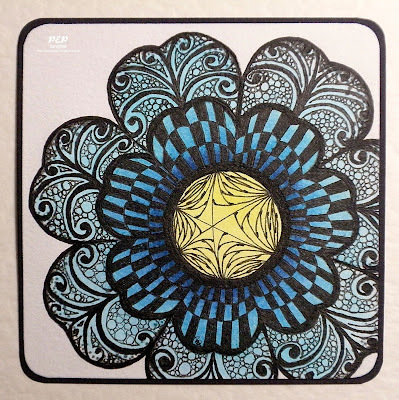 I used the large open flower image for my tile which I then mounted onto a piece of black cardstock making it a ZIA (Zentangle Inspired Artwork - any artwork incorporating tangles which differs from the standard 3½ inch square tile). 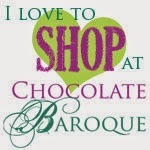 Chocolate Baroque also stocks other Zentangle Supplies (books, tiles & Sakura Pigma Micron pens etc....) plus a selection of Dreamweaver Stencils (some of which are featured in Zentangle 6). I stamped the flower using grey ink as I wanted to have a framework for my tangles & yet be able to ignore the stamped lines if I wished to. I came to the conclusion that I had to either colour the flower or shade the tangles - I have much to learn in this department, besides which I'm also unfamiliar with watercolouring using the Distress Stains - & settled for colouring the flower. I actually watercoloured the flower first, dried it off with my heat gun & then worked on the tangles. Stamp Chocolate Baroque UA4SP0400 Tangled Garden. Inks VersaFine Smokey Gray; Broken China, Chipped Sapphire, Mustard Seed &Tumbled Glass Distress Stains. Pens/Markers 01 Black Uni Pin Drawing Pen (tangles), Memento Tuxedo Black Dual Marker (edging tile). I have lots of ideas for this challenge but my crafting time has been somewhat curtailed by a breakdown in my migraine control. As a consequence this blog & PEP & Paper have been rather lacking in posts, so my apologies if you have visited & found nothing new. Migraines are the real pits Paula, I always say that unless you suffer from them you never understand how debilitating they are. I do hope they get yours under control again. I am pleased to see you have been able to do some tangling though, I black and blue looks very attractive with the yellow centre which really draws the eye into the piece. I think tangling is beginning to become more popular, I've heard a few mentions of it round and about and also saw the Dreamweaver programmes. Hi Paula. Hope you're feeling a bit better. Your Tangled Flower is gorgeous. I hope to join in this month, but can't hold a pen yet after op! Paula - this is beautiful. I love the gently graduated shading - so very pretty. Hi Paula, I love the layered look of the flower, your choice of tangles is superb and the colour shading is super, the 'off the page' stamping works really well. So sorry to hear that you have been struggling with your migraines, I did suspect that was the case as you normally post on a more regular basis. Do hope that you get your medication sorted soon, will be thinking of you. Hi Paula,lovely to see you posting again. Mum suffers from migraines so I know how disabling they can be. I really like this zentangle especially how you have shaded the layer around the yellow centre. It really draws your eye in. Love your flower and looking forward to the new March challenge! Hugs to you and hoping your migraines let up...they are such a nightmare, so crippling, praying you find relief very soon! I miss your posts! This is brilliant and love the patterns you've chosen and the colour. Sorry to hear you've continued to have problems - hope they sort you out soon. another fabulous creation Paula, but a bit complicated to do if you're susceptible to a migraine! thank you for your kind words, they are much appreciated. Wow! This is a gorgeous flower worthy of a frame, Paula. Your strategically placed tangles gave it so much volume, as did your subtle color shading. I knew you hadn't been posting, but I figured you were busy. I'm sorry to hear you were not feeling well, but thrilled your back sharing your art work. Blessings! Hi Paula, I am not a great fan of Zentangling but this flower is very beautiful. The yellow centre really gives it extra depth. I am so sorry that you struggling with the migraines and truly hope you can get the right treatment soon. Do hope you are feeling a little better. What can I say but stunning! This is so perfectly pretty, perfectly balanced and totally delightful. I think you really excel with tangles. I hope your migraines are now back under some sort of control again. Lovely flower tangle Paula, the shading of the blue from the dark centre to the lighter edge gives it such depth . ohhhhhh!!!! migraines - don't talk about them!!! I do hope you are feeling better now!!! Your image is stunning - a wonderful design and your colouring is beautiful!! this is beautiful, paula, i love the light touch of color!